Using modern high quality nylon wall fixings and screws, DIY is pretty foolproof nowadays. Whether you're hanging pictures, putting up shelves or erecting curtain track, nylon fixings, such as the fischer S-Plug or SX-Plug, normally work very well. However, disasters can happen to the best of us. Maybe you've drilled the hole too big for the plug or perhaps the material you're drilling into is too crumbly and the hole's gone 'baggy'. Perhaps you're hanging some new curtains on existing poles and the old fixings have pulled out of the wall. Maybe you're now regretting putting those heavy books on that old shelf. Whatever, you've got a problem. How are you going to rescue the fixing so that you can indeed hang your new curtains or keep your heavy books on that shelf without the risk of the whole lot tumbling down! fischer WetNFix is a unique multi-award-winning product which will very likely help you out in your hour of need! It comprises a safe-to-use impregnated disc which you simply moisten, wrap around a new wall plug and insert back into the offending hole. In just three minutes, the disc bonds plug to wall to provide a secure and permanent fix in the hole, reinforcing and strengthening the area around the fixing. It's very much a case of the simplest ideas being the best! 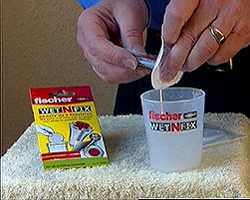 fischer WetNFix is a practical solution for the fixing of wall plugs into a variety of problem or poor quality surfaces, such as crumbly masonry, ceramics, plaster, plasterboard or wood. It can also be used to repair an existing plastic fixing which has shrunk over time and lost its grip. 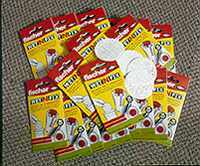 It will provide an immediate, secure and smooth fix with all types of plastic or nylon wall plugs.